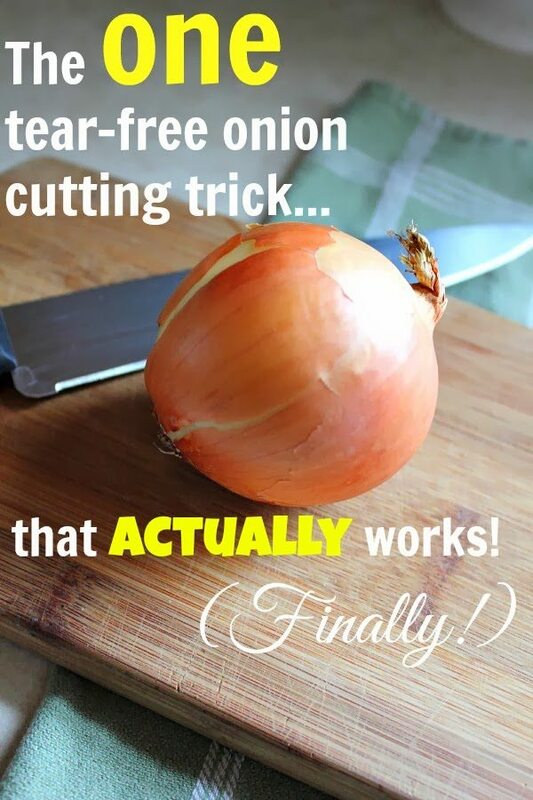 This is the best tear-free onion chopping trick. 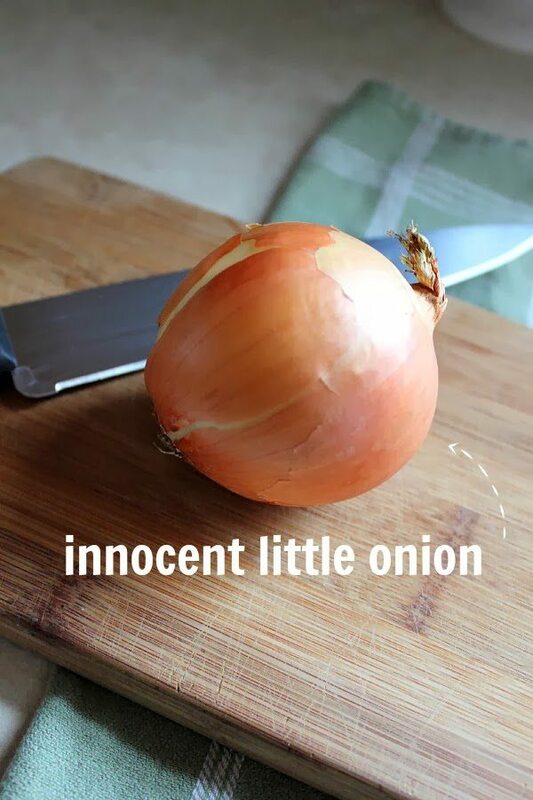 With this technique you’ll be dicing, slicing, chopping and cutting onions without tears. This. THIS is a good one. I’ve heard all kinds of old wives tales about how to stop yourself from crying when you’re cutting onions. Haven’t you? Do any of them really work? Not for me, they don’t. It’s amazing how dramatic dinner preparation can get sometimes when you take a sweet little onion, that brings so much joy and flavor to your dishes, and try to actually put it into whatever you’re cooking. It’s worth the tears and all, but why go through that if you don’t have to? Which is why people are always trying to figure out how to do that. And failing. Well, the one trick that does work is really simple. So, so simple. Like, so simple I feel funny even writing a whole post about it. Like, caveman simple. Me. Jane. Fire. Make. Onion. No. Ouchie. 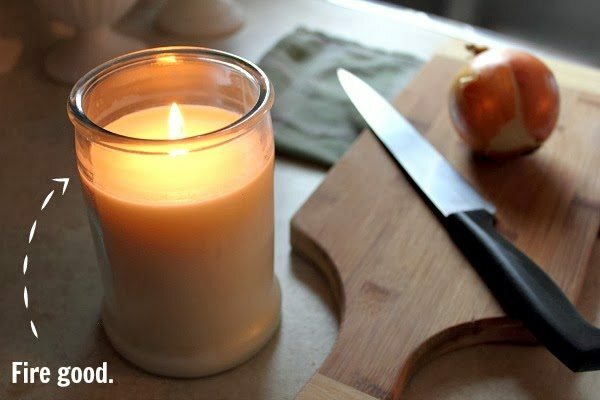 In case you don’t speak caveman, all you need to do is light a candle next to where you’re working and the flame will burn most of the evil tear-creating onion juices out of the air. It really works! I think it’s kinda like when you have a fireplace on and the air gets really dry because the fire burns all the moisture out of the air. Anyway. It’s amazing. And it makes me happy. Or at least it makes me look happier when I’m cutting onions! Ha! Do you have a favourite trick for cutting onions without tears? More helpful ideas like this that you’ll love! How to clear up a nasty sinus cold using essential oils! I am so excited to try this! I had to cut up a little onion today and I could not stop bawling!! Its actually oxidizing the irritating chemical created when you break the cell walls of the onion. How do you get it to work for you? I’ve tried and tried it, but I would have to burn down the house to get enough flame to keep my eyes from burning up! “tearing” because the irritation comes out the top. Actually, it comes from the root. Gordon Ramsay has a video on youtube of how to do it with minimal tear juice. There will always be some though. I was about to say that. Let’s learn from the pros, they’re pros for a reason. I just chew any flavor I have handy. It’s the only thing that works for me. Also, you don’t have to worry about burning the house down if you knock over the candle. When I cut onions I cut my onion in half and run each side under really cold water. It gives me a few minutes to cut them tear free. Sometimes if an onion seems to be more pungent than normal I will place both halves in a bowl of cold water for a few minutes before I chop it up. If I’m not going to be throwing them in a pot or pan right away I will keep the chopped pieces in a bowl of cold water so the smell doesn’t linger around the kitchen. The best way is to use lemon juice on the knife before cutting. The candle trick didn’t work for me, my husband saw the lemon juice trick on a science show and it is the only thing that works for me and it didn’t leave a lemon taste to the onion. I put the onions in the freezer for a few minutes before cutting. fresh onions always make me tear up, cold onions that have been in the frig for awhile never seem to. It sounds ridiculous but if you bite on a wooden spoon while you’re cutting your onions, you WONT tear up. I promise you it’ll work! In the movie, The Help, the advice given was to hold a match between your teeth. I assumed it was a wooden match, and tried it. It worked! Thats because you are breathing through you mouth in stead of your nose. In a little time you can do without the toothpick or match. The candle is sound advice. I usually open a window and cover my mouth and nose, so as not to breathe in the fumes. Depending on the strength of the onion, it works. The only other day it resulted in a terrible sore throat (I already had a cold) and the taste of onion for hours, but no tears. Which makes sense: it’s a nervous system reaction, the tears being a side effect. It doesn’t directly affect the eyes. As you said, everyone reacts differently. Ladies, I’m pretty sure she meant it when she said that the list of nonsense y’all enumerated doesn’t work for her. And of all the suggestions, the candle makes the most sense. Thanks for that. I’ve tried all these tips and they don’t work for me. I wear swim goggles when I cut onions. It works like magic. No watery eyes, no runny nose. I could cut onions all day with my goggles on. Who cares if my husband makes fun of me! I wear swim goggles, too! I have tried every single trick imaginable (including this candle one), to no avail. I am so sensitive, that sometimes just cutting green onions makes me tear up (usually only when I’m pregnant, it’s awful)! Totally get made fun of, but it’s worth it! My husband used to do that. He used his diving goggles. It looked really funny but it did work. I bought special onion-cutting goggles (from Amazon). I love cooking with onions, but my eyes got so bad that I was seriously considering giving up onions altogether, because it hurt so much. I figured I might as well try the goggles, as a sort of last-ditch effort, because I had tried every trick in the book and none of them worked at all for me. The goggles work perfectly— I can still smell how strong the onion is, but I don’t tear up in the slightest. It’s fantastic. Yes! This is the only thing that works for me too. My kids and my husband crack up. All of my kids are swimmers so we always have dozens of goggles around the house. I tried chewing gum, open window, multiple candles, cutting from different ends. Googles work! Nothing ever worked for me. Then the hubby bought me a pair of “onion goggles” and my eyes have never been happier. Hubby and I both use contact lenses and they have the added benefit of keeping you eyes from tearing up over onions. What gets me is when I start with an onion and I forget I’m not wearing them! Another solution: I bought a small battery powered fan and set it on the counter so it blows across the cutting board where I usually do my cutting and chopping. It blows the onion gasses away, the batteries (AA) have lasted more than a year and No Tears. I found this out accidentally during one summer when I had an oscillating fan blowing across my kitchen from the dining area. The onions I chopped never bothered me and when I figured out why, I looked for a small fan and found a folding fan that fits in the drawer below the counter. I can operate it one handed, folding down the base and sliding the power switch and it is easy to put away. I’ve been using the fan trick for a year now. It’s 100 percent effective. The freezer trick works. It takes 10-15 minutes of freezer time to start to freeze the juices, without freezing the whole onion. I recommend using a timer, because you can’t cut it up if it’s completely frozen, & it gets limp once it’s thawed. If this works, you are my hero. Pinned and followed on bloglovin! All you have to do is bite a stick match between your teeth while cutting the onion. The sulfur tip somehow dissipates the onion fumes that make you tear up. Make sure the sulfur tip is outside and you do not have to light it. Neat! I’m going to try that one! I’m going to try this one tonight! Thanks!! When I buy a bag of onions, I put them in individual ziploc bags, for convenience, and put them in the crisper in the refrigerator. There they stay until they get used. Haven’t cried over onions in years! It works, i have been doing this for years. i usually have two candles burning . one on each side of me. This was a new one on me ! I will have to try it. I usually cut an onion so fast that I don’t have time to get watery eyes. I do make sure to use cold onions as they seem to create less “fumes”. I think combining both these tips will really help my souse chef (hubby) as it affects him most ! I try to not get emotionally attached to my onions before cutting them up. My contacts protect me as well. I usually chop up a whole bag of onions at once and put them in the freezer, taking out the chopped amount as needed. 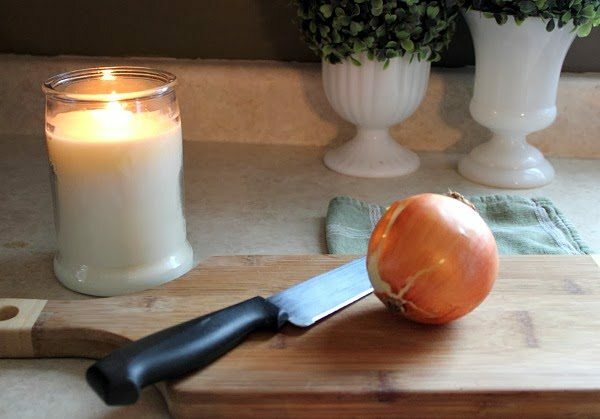 Tried the candle and it didn’t work, none works but running the onion under cold water after every few chops, if I chop next to the sink it doesn’t really add any extra time. I’m so going to try this. Cute post! I’ll have to try that. I’ve heard you can turn on a gas stove flame to do the same thing, but it’s never worked for me. I put my cutting board on top of my stove and turn on the vent before chopping an onion. Works for me every time! I put my onion in the freezer while I get the rest of my misenplace put together. The cold helps reduce the amount of juice sprayed into the air while cutting. Also, make sure your knife is very sharp and it is helpful to have ventilation in the area. I rarely tear while cutting onions, any onions. I don’t do any of the preceding tricks either. The only thing I can think that I do differently is I take antihistamines for my allergies and have done so for 40 years. Seems extreme (but those other “tricks” aren’t?) but if you are going to be peeling/chopping a lot it might be worth it. Hmm, probably the only thing that you can do is try to add in a bit more stock to help bring down the spice. I will have to try this candle trick! I usually wear swimming goggles to avid the tears! I look ridiculous, but it works! My son (11 yrs old) just wears his swim goggles when he has to cut an onion. Hey… it works! This works! I tried it the first time months ago and was very skeptical. You can still smell the onion when you cut it, but it does not make you cry! I have a small fan in the kitchen – always. I use it when I get too warm but also when cutting onions. Point it at your onion and it blows the aroma and tear making “stuff” away from your nose and eyes! WOW! Thank you for this one! I have to chop onions tomorrow and will try your suggestion!!! Yay! So glad I got this posted in time for it to be helpful to you! The onion gives out its juice when you cut across the fibres. If you cut along the grain, i.e. from top to bottom, then you won’t have a problem. This worked for me and now I always cut onions this way, cutting each one in half lengthwise and then slicing down from top to bottom. If you want them really finely chopped, you will need to cut across the grain, but I always leave this until last and give a few quick cuts across the grain to finish. Of course if you like onion rings this is not a solution! The scent is drawn to the nearest form of liquid, your eyes. Turn the faucet on (it doesn’t have to be full force just enough for a steady flow) and cut near the sink. It will be drawn to that instead of your eyes. There is absolutely only one way to prevent your eyes from tearing up when peeling and chopping onions, and it will definitely work every single time. There is NO way that this will not work. And it’s so easy – just have someone else chop it for you.